First of all… Happy Pi Day! Second of all… Yes, this post contains projects finished in 2013. I haven’t been good about taking pictures lately. 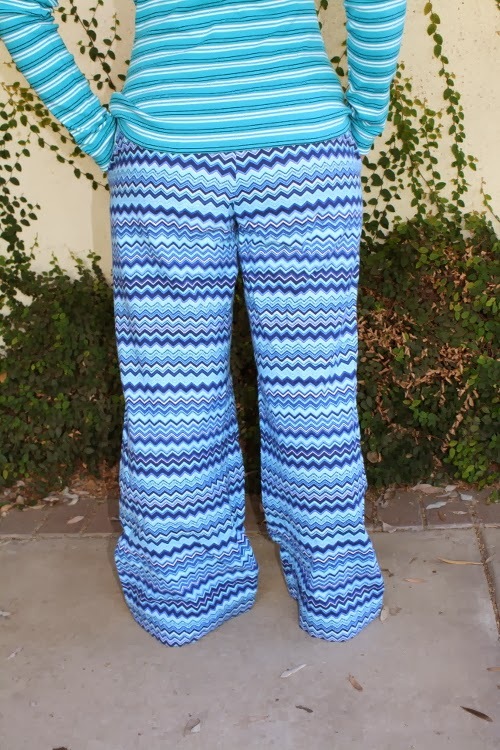 So, it turns out I did actually end up making some pants in 2013. At the very very very end. My sister and I got invited to a New Year’s Eve Pajama Party. And guess what I have been needing to make for a really really long time? PJs. 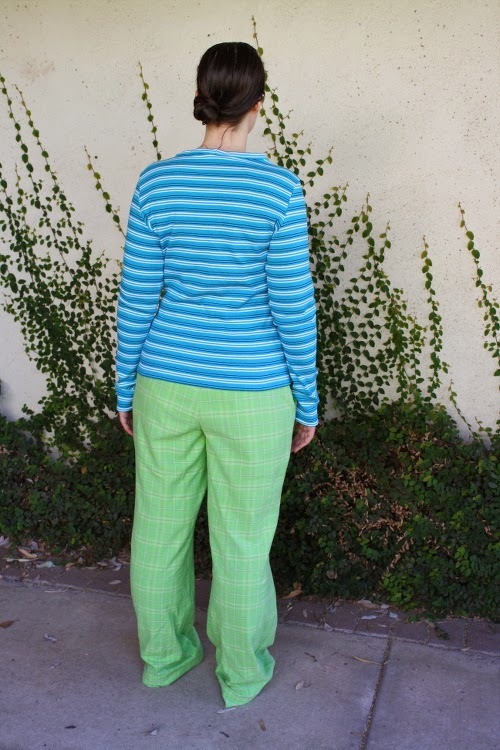 Luckily, I picked up some cute flannel prints just a few weeks earlier (before I knew about the party – it was all very serendipitous like that), and cut them out using my TNT Burda pattern the morning of the party. 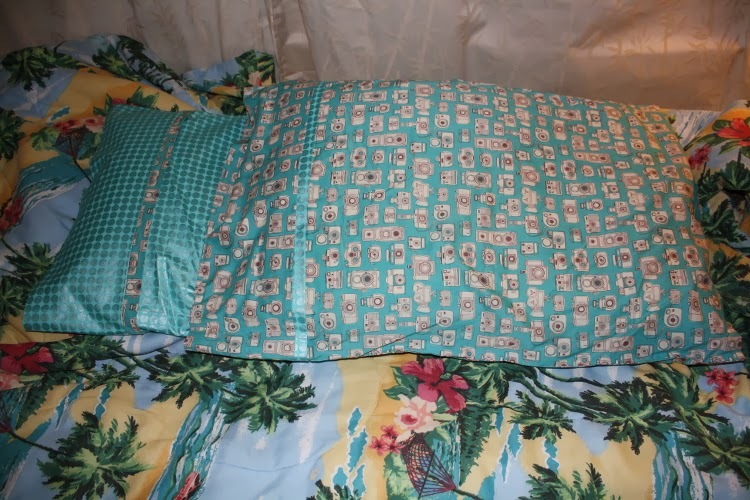 BS-06-2011-114A – My TNT PJ pattern. I cut out both of my fleece prints, but only managed to get one sewn before the party. And I mean right before the party. Like, hemming in my underwear before throwing them on and walking out the door right before the party. And (full disclosure) I may not have pressed all my seams as much as I should have. Cue gasps of shock and horror. But, well, I think they turned out pretty well in spite of this oversight. My second pair didn’t get sew up until after the new year, and I was a bit better about taking my time to deal with all the seams properly. 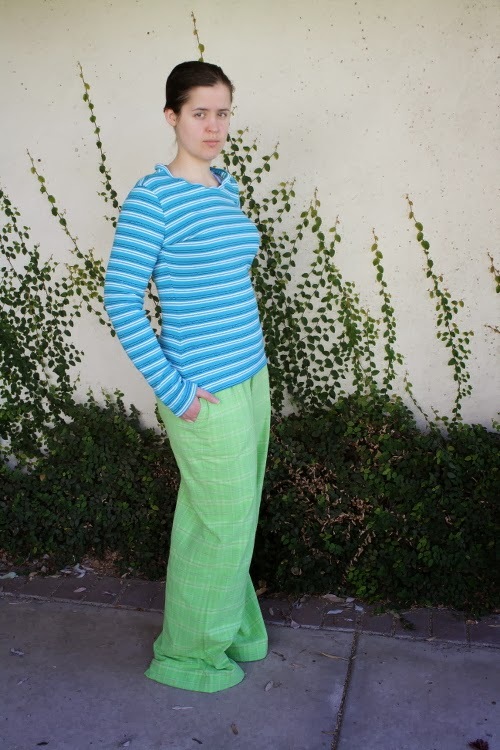 The third pair was made from some lime green plaid flannel I got as part of a Fabric Mart Mystery Bundle. I cut it out quite a while ago, but only actually sewed it together quite recently. PJ pants! New Year’s party edition. The selvedge informs me that this fabric is not intended for children’s sleepwear. Good think there are no children here… Err… wait…. 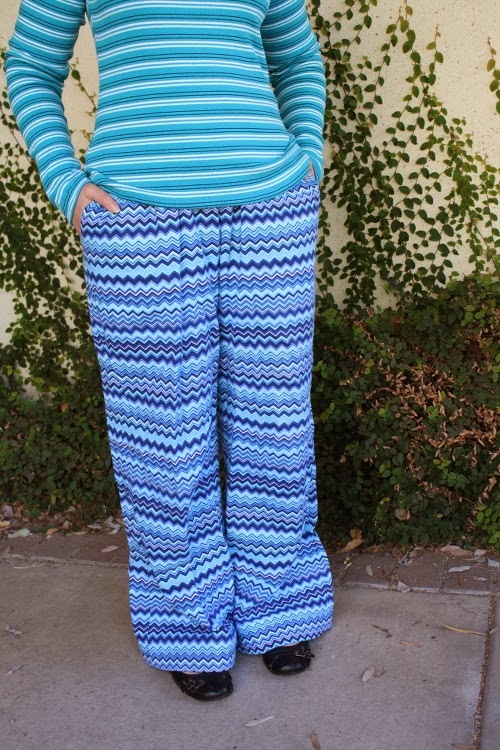 Version #2 – crazy zig-zag flannel pj pants. Yeah, there is a seam there. And a pocket. Pretty darn pleased with my stripe matching. seeing in Burda. Maybe in not quite so bright a color… but… is a possibility? 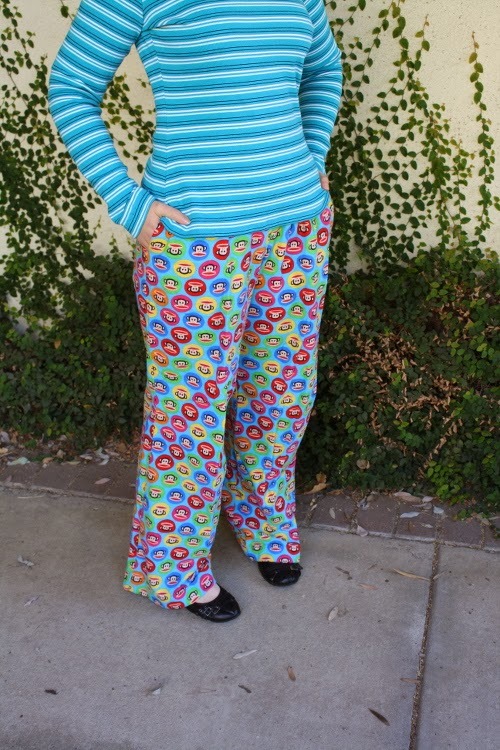 Aside from making lazypants loungewear, I did manage to get a bit more sewing done in the past few weeks. Mainly some pillowcases for my sister (because I didn’t get her actual Christmas gifts finished in time), and a shirt for me. 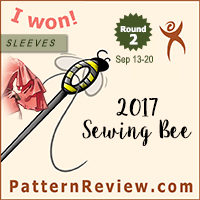 I like the shirt, which I made from BS-02-2011-106 (the first Burda pattern I ever made), but the fabric was so stretchy the neckband didn’t quite turn out as I had hoped. And the hems weren’t much fun either. Oh well. I don’t relish the idea of unpicking the stitches, I love the color, and it is super comfy, so I think I am just going to have to live with it. Both patterns have been made before, and will likely be made again. You can see how the neckline gapes quite a bit, but that is entirely due to fabric choice. but it is close enough to live with for pj pants. More pillowcases, using the same tutorial as earlier. Found the fabric in LA, and made these as a late Christmas gift for my sister. I love the one with all the little cameras! 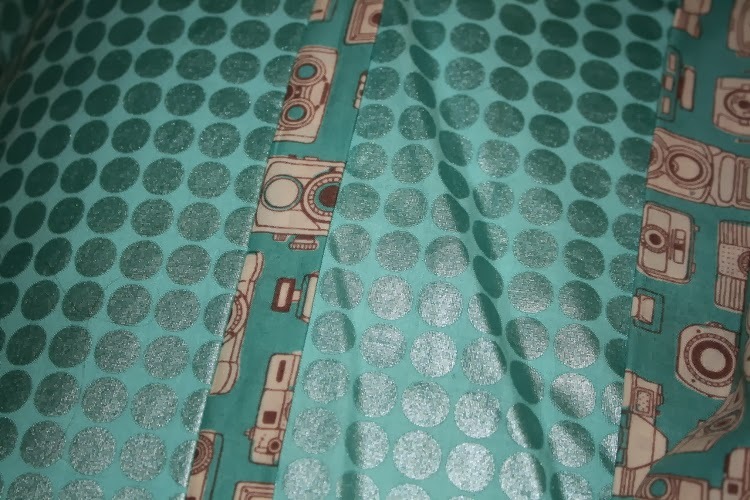 The other one uses the camera print as a trim, and a shiny dot cotton as the main print. Overall I am super pleased with my pajama pants. I really like this pattern. It sews up really quickly, and I LOVE having pockets in my PJs. 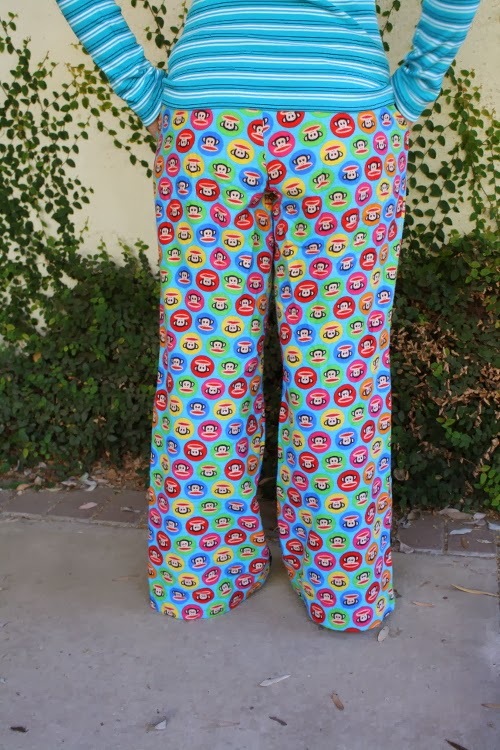 How many people at the New Year’s party were jealous of pockets in PJs? Pretty much all of them. Guys don’t seem to have this problem, but girls? Nary a pocket to be found. 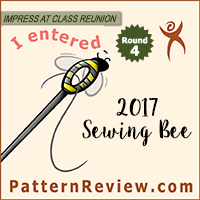 I have made this several times before – you can read my original review here and my non-PJ version here. The only change I made this time around was to cut the length for view B (the version with hem cuffs) instead of view A. I made regular hems, but they were extra wide, so a bit weightier than my earlier versions, which was nice. My first version is just a bit too short, so my feet were always getting cold, which was a bit annoying because I have really cold feet to begin with. It also seems to help give the flannel some weight and hang better than my first version. Though maybe the slightly better quality of fabric that helps a bit as well. And they are so much warmer than the JoAnn’s flannel I used previously. Just have to hope they hold up well to excessive use. Either way they were fun for the party and I am really happy to *finally* have new pajamas. It means I can finally toss the old rags that I have been wearing for the past decade. Yes, I know, decade. The elastic waistband was so stretched out I literally had to hold them up when I walked. I may or may not have resorted to safety-pinning them to my underwear to keep them up. And the fabric was pretty transparent in some areas. Yeah, it was that bad. Like I said, I really, really needed new PJs. As far as upcoming sewing plans… definitely going to be focused on skating costumes. Actually, most of these stuff got sewn several months ago, and I only just got around to posting photos of it. 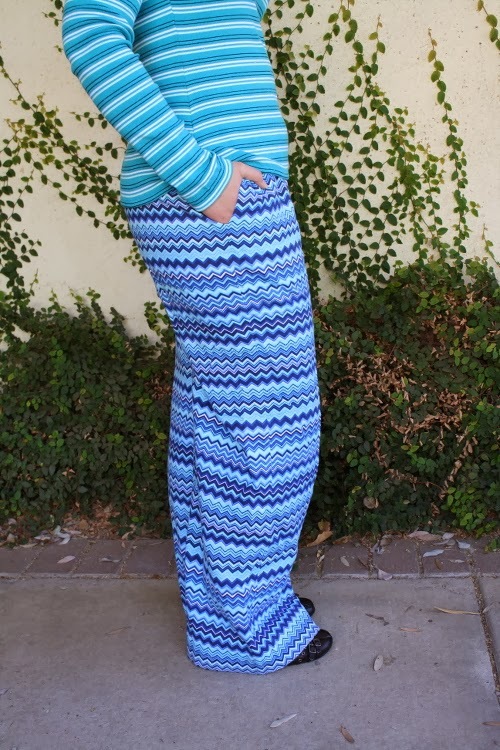 I have a few other un-photographed projects, as well as a bit of a fabric stash confession to make in an upcoming post. Definitely have a long list of things I want to sew, but an even longer list of things I have to sew. Fun-for-me sewing might not happen until late summer at this point. But, well, skating season is upon us! Love the PJ parade – especially the monkeys! 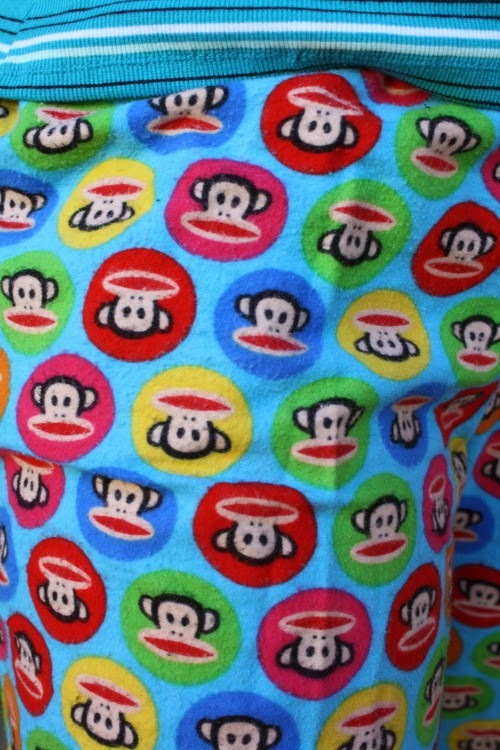 Ten little monkeys jumping on the bed… Great pants! 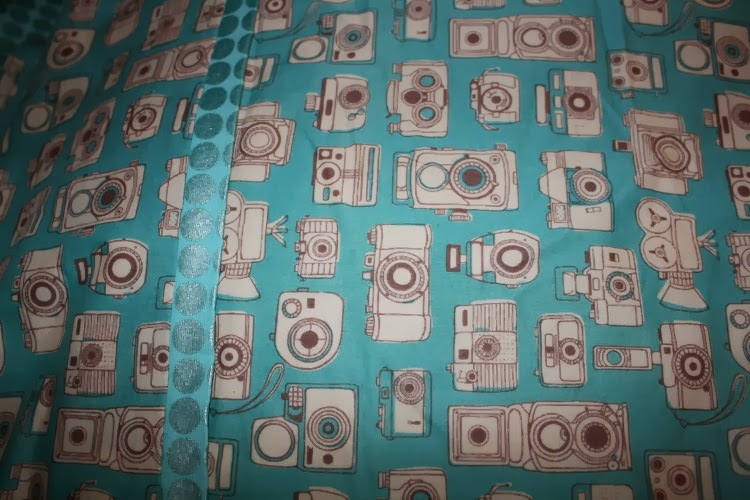 And I love the camera fabric!!! !